An All Digital Xbox One S? 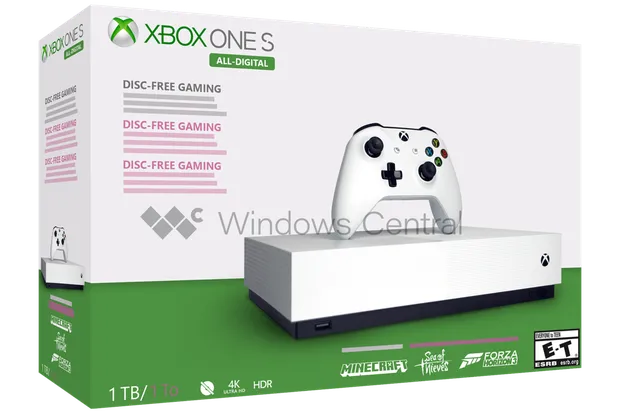 Did Microsoft choose to go all digital and release a Xbox One S with NO disc drive? Microsoft goes all digital with another Xbox one. Before you ask, no, it's not an early April fools joke. Microsoft has sent out product photographs of their next Xbox. Code named Maverick, the disk-less system will be ditching the Blu-Ray drive completely. The design of the console looks like a direct copy of the Xbox One S. It will have a 1TB Hard drive, 4K and HDR Support and comes with Sea Of thieves, Forza Horizon 3 and Minecraft. Although Microsoft hasn't formally announced it yet, leakers have confirmed we don't have long to wait. In fact, they say 7th May 2019, with all existing Xbox markets targeted in a global simultaneous release. The Xbox Maverick won't be bundled with Xbox Game Pass nor Xbox Live Gold. From our sources, the Xbox Maverick will be priced at the lowest for RRP. With this information, Microsoft isn't quite ready to ditch disc games any time soon as they are gearing for next-gen consoles; Project Scarlett, Project Lockhart and Project Anaconda. These are currently speculations so please treat this with a pinch of salt until Microsoft announces it formally.